In November 2016, Ceva achieved a notable first for the animal health industry as the successful implementation of this service program received independently Quality Recognition from the international testing, certification and control company, Bureau Veritas Group. 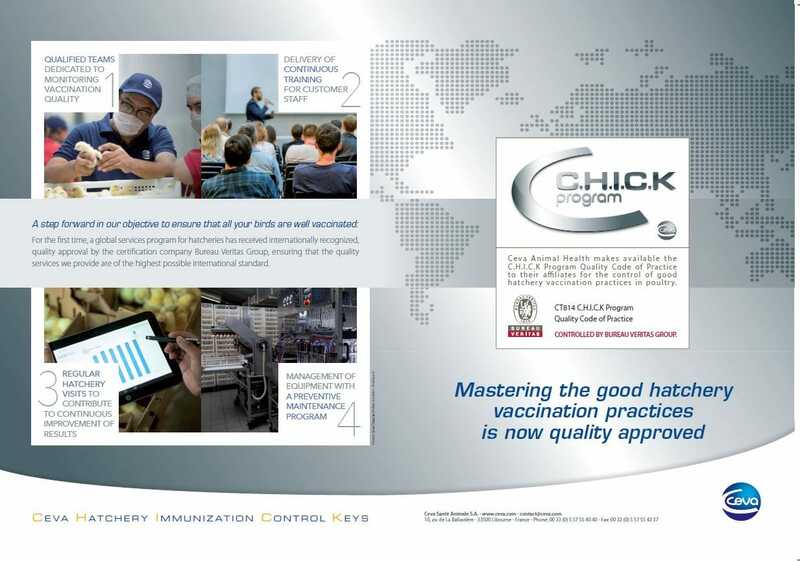 From that moment Ceva made available a unique C.H.I.C.K Program ® Quality Code of Practice to their affiliates for the control of good vaccination practices in customer hatcheries. As a new international standard, compliance with it will be now controlled by this renowned independent control body. Already, and in less than 2 years, teams in 18 countries and on 4 different continents have passed quality control audits and obtained “Quality Recognition” by Bureau Veritas Group, but Ceva aims for this Quality Recognition to be implemented globally. In fact, more countries are under preparation and assessment at the time of this writing. Created in 1828, Bureau Veritas is an independent certification body, a global leader in laboratory testing, inspection and certification services, leading provider of ISO 9001 and ISO 14001 quality management and environmental management certifications respectively.